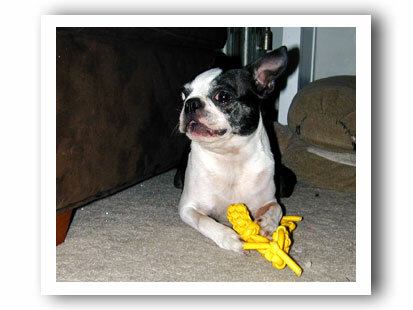 Braided rubber tubing that is stretchy & snappy & chewy. The Chewapalooza benefits the St.Charles Humane Society. Mention Bergamot & Emrys' Toy Test and a percentage will go to BTHaven.org. Emrys went crazy for it and has dominated it but Bergamot got in a few tugs with her. She especially enjoyed running around and shaking it at a gallop. Bergamot got to have a turn eventually and really enjoyed holding it down and having a good gnaw. 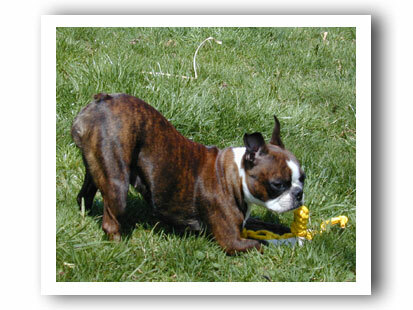 Very stretchy, chewable and floppy! 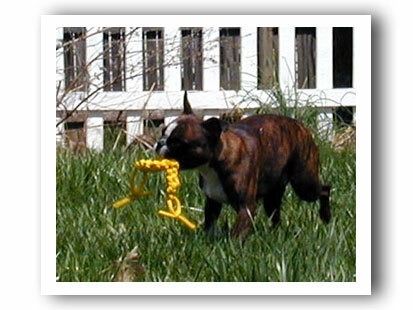 A really fun fetch and chew toy. 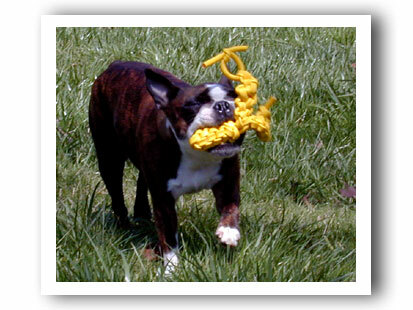 Both Beasts like to fetch it and like to run with it flopping out of their mouths. Emrys really enjoyed holding it between her paws and pulling on it. 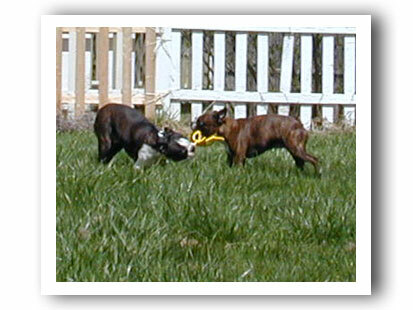 The Beasts attempted a few double-dog tuggie sessions but backed off after someone let go with a snap. 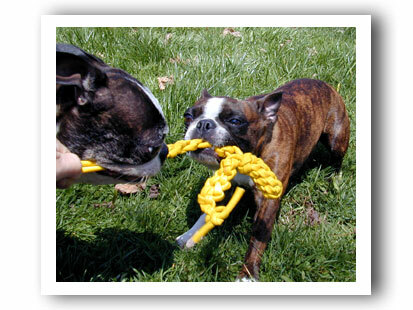 They seem to have decided to only play tug with the Chewapalooza when a human toy holder can be the recipient of the snap!...Smart Little Monsters. "I would like a turn!" "When I run with it, it tickles me in the face...when Bergamot tries to pull it out of my mouth, I let go and it hits him in the face! 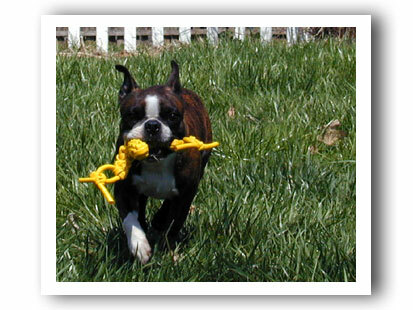 This is the toy I have been dreaming of!" The Beasts have not been able to put a mark on the Chewapalooza. They have had it for 5 days and have dedicated themselves to chewing and pulling on it. Still counting from April 20th 2004. I think this is going to be a keeper - the knots have not even loosened and there is not a tooth mark to be seen. The Chewapalooza is a unique toy that really grabbed the Beasts attention! I think it will bring many months of chewy & tuggy fun. 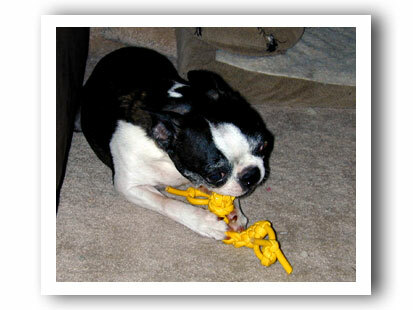 As an added bonus the toys are made to benefit Scoopy's animal shelter. 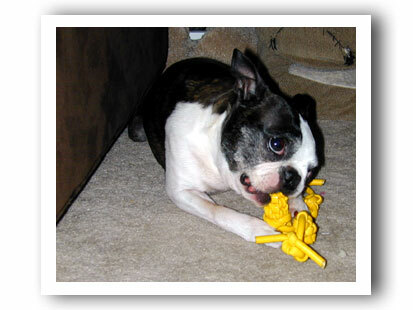 The Beasts haven't put a dent in it yet - but as always keep an eye on your Boston Terrier with any toy. It should be removed if it begins to show chew damage. 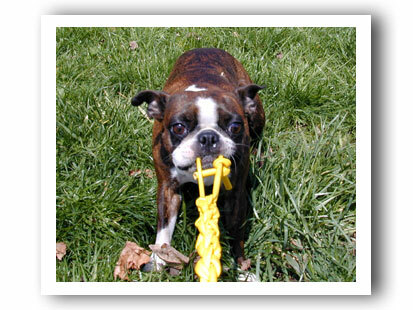 I would also use care during tug-o-war that no one gets snapped in the face or eye. I - want - it! Oh the joy! It is mine! Now I will run away with it! It tickles my face when I run! ...Nah! Nah! Its all mine! ... Finally! I get a turn! Oh Boy! This is gonna be great! Yes! Yes! It is just like I imagined - chewy and tuggy! A Beast can really work out some frustration with this toy!